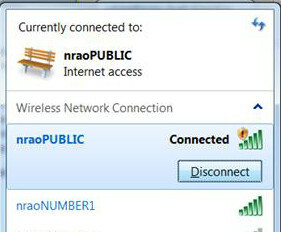 Visitors to NRAO-CV may use the nraoPUBLIC unsecured wireless network. 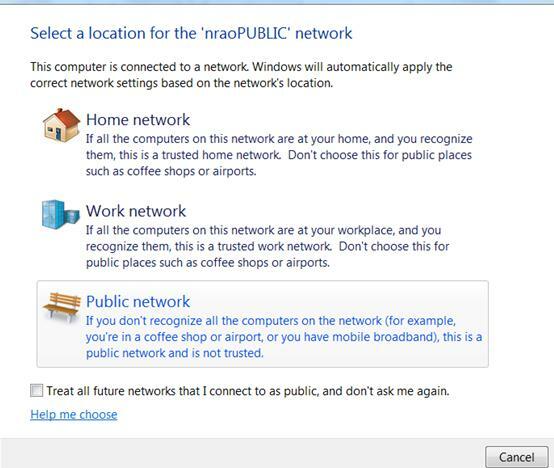 Open the "Network and Sharing Center" and select "Public" to apply the proper security settings. 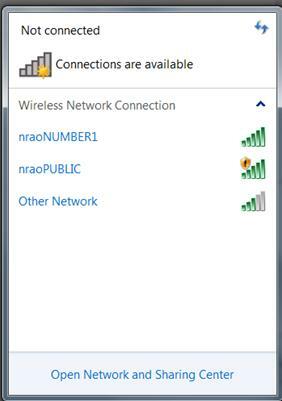 To disconnect, click the "wireless connection icon" in the system tray to display the Available Connections dialog. Then click "Disconnect." 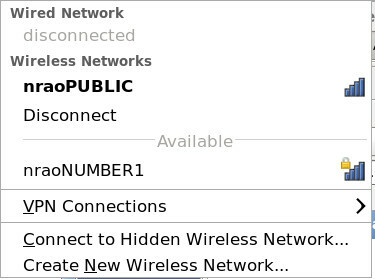 To connect to the internal NRAO-CV wireless network, open the Network Manager by clicking on the Wireless status icon and select "nraoPUBLIC" from the available connections. To learn more about your current connection you can right click on the icon and select the "Connection Information" option. This will tell you things like the interface used, speed, IP address and other basic network information.